Copyright: © 2015 Connell GO, et al. This is an open-access article distributed under the terms of the Creative Commons Attribution License, which permits unrestricted use, distribution, and reproduction in any medium, provided the original author and source are credited. An experimental method is presented for the first time to determine the concentration of nicotine in exhaled breath following e-cigarette use in experienced participants and the impact that vaping topography has on the retention rate of nicotine. Aerosols from e-cigarettes containing different concentrations of nicotine were first evaluated by GC-FID to determine the concentration of nicotine delivered per puff versus machine - vaping intensity. These e-cigarettes were then vaped by participants through a cigarette holder attached to a smoking topography analyzer which recorded puff volume and puff duration. This allowed the concentration of nicotine in the aerosol inhaled by the participant during each puff to be determined. A PTR-MS instrument was then used to determine the concentration of nicotine exhaled following each use of the e-cigarette. By dividing this figure by the nicotine concentration delivered enabled its retention rate to be calculated. The principal finding was over 99% of the nicotine was retained by the participants when the e-cigarette aerosol was inhaled and a reduced but still substantial quantity was retained (on average 86%) when the e-cigarette aerosol was held in the mouth only (i.e, no inhalation). In both cases, the nicotine concentrations detected in the exhaled breath were low (range 1.8 - 1786 ppb). The experimental method presented here may be used to determine the concentration of other e-cigarette aerosol constituents in exhaled breath and the retention rate of those constituents which is useful for the evaluation of e-cigarettes from a consumer and bystander perspective. Electronic cigarettes (e-cigarettes) are battery-powered devices that deliver aerosolised nicotine, propylene glycol and/or glycerol and flavourings to users (“vapers”) from an “e-liquid” . As they do not contain tobacco or require combustion, they are gaining acceptance with smokers as alternatives to traditional tobacco products . For example, the UK public health group Action on Smoking and Health (ASH UK) recently reported as many as 2.6 million adults in the UK currently use e-cigarettes , and a recent survey in France reported that between 7.7 and 9.2 million people had used e-cigarettes, with 1.1 to 1.9 million using them on a daily basis . E-cigarettes are available in many configurations: the two main classifications being ‘closed’ systems i.e., disposable or replaceable cartridges pre-filled by manufacturers and ‘open’ systems which can be refilled by the consumer e.g., tank systems. When the e-cigarette user takes a puff, a heating element is activated and converts the e-liquid in the cartridge or tank into an aerosol that the user can retain in the mouth or inhaled prior to exhalation. There is a growing interest from regulators and public health organizations to understand the potential implications of e-cigarettes. Moreover, some studies have reported the presence of small quantities of some potential toxicants in e-cigarette aerosols including carbonyl compounds (e.g., formaldehyde), volatile compounds (e.g., toluene) and Tobacco-specific Nitrosamines (TSNAs; N-nitrosonornicotine (NNN), (4-methylnitrosamino)-1-(3-pyridyl)-1-butanone (NNK)) [5,6]. Where detected, such chemicals have been found to be at significantly lower levels than those reported in tobacco smoke and similar to trace levels generated by a nicotine inhalator . In a systematic review of e-cigarette aerosol chemistry studies, Burstyn concluded that e-cigarettes use does not produce inhalable exposures to chemicals in the aerosol that would warrant a health concern to the user . Regulators and the public health community are also keen to understand whether the aerosol exhaled following use of e-cigarette products has implications for the quality of air breathed by bystanders. An indoor air quality model was recently published which evaluated potential bystander exposures to exhaled e-cigarette constituents, in particular to exhaled nicotine . In evaluating the respective contribution of different model parameters, here the authors identified ‘quantity of chemical constituent exhaled’ as the most important factor influencing indoor air quality and bystander exposures. Therefore, to understand the potential impact of exhaled nicotine on indoor air quality and bystander exposures, it is essential that measurements are made regarding the quantity of nicotine exhaled by the e-cigarette user (i.e., the fraction not retained by the user). The analytical technique Proton Transfer Reaction-Mass Spectrometry (PTR-MS) is a sensitive tool for the simultaneous realtime monitoring of volatile organic compounds (VOCs) with high sensitivity and is well-established in various fields of application including environmental and biological sciences, food and flavour research, medical and pharmacological sciences and detection of threat agents . It is particularly well suited for the online analysis of exhaled breath, as has been demonstrated e.g., by Herbig et al. . Very recently, Blair et al. published a study where they quantified acetaldehyde, acetone, acetonitrile, acrolein and menthol concentrations in mainstream conventional cigarette smoke and mainstream e-cigarette aerosol using PTR-MS . However, Blair et al. did not report any data on the concentration of nicotine, the active compound in e-cigarette aerosols, nor did they perform any participant analyses to determine the concentration of aerosol constituents in exhaled breath using PTR-MS. Here a real-time PTR-MS experimental method to determine the concentration of nicotine in exhaled breath for two e-cigarette use (“vaping”) topographies, namely inhalation and mouth-hold (i.e., no inhalation), is presented for the first time to our knowledge. The exhaled nicotine data is compared with the concentrations that have been inhaled, as determined from the individual e-cigarette user’s vaping topography (measured using a puff topography analyser), when using calibrated e-cigarettes first evaluated by gas chromatography (GC) coupled to a flame ionisation detector (FID) (GC-FID). By comparing the inhaled and exhaled concentrations this gives an estimation of the nicotine retained by the user. The inhaled and exhaled concentrations and thus the retention rate of compounds that may be present in e-cigarette aerosols are of significance for the evaluation of e-cigarettes from a consumer and bystander perspective. The proofof- concept work presented here indicates PTR-MS is a powerful tool for real-time quantification of exhaled e-cigarette aerosol constituents, for the determination of their retention rates, and represents the basis of our ongoing developments and improvements on the experimental setup, which will be published in due course. In this study, 8 mg/g, 16 mg/g and 20 mg/g nicotine ‘original’ flavoured Puritane™ rechargeable e-cigarettes (‘closed’ system; battery capacity: 260 mAh) manufactured by Fontem Ventures B.V. (Amsterdam, The Netherlands) were used. The base e-liquid used in the products consists of a mixture of propylene glycol (67% (w/w)) and glycerol (30% (w/w)) in which pharmaceutical grade nicotine and small amounts of flavourings are dissolved. Using a linear smoking machine (LX1, Borgwaldt, Germany) and the vaping regimes reported in Table 1, e-cigarette devices with cartridges containing different nicotine concentrations were first machine-vaped and evaluated by GC-FID to determine the average concentration of nicotine delivered during a puff versus puff duration. This allowed a calibration curve to be generated (Figure 1). The puff volume was adjusted to maintain constant airflow (average 13.7 mL/s) independent of puff duration . Given variability in device performance and nicotine delivery for some e-cigarette products reported in the literature [13,14], two e-cigarette devices were calibrated in turn (termed ‘device 1’ and ‘device 2’) in this study and the corresponding calibration Curve was used when determining the concentration of nicotine inhaled. Before each regime, the device batteries were fully charged. Table 1: Smoking machine parameters used to determine the relationship between e-cigarette nicotine delivery per puff and puff duration by GC-FID. Figure 1: Calibration curves of concentration of nicotine per puff (ppbv; parts per billion by volume) vs. puff duration (s) in mainstream e-cigarette aerosol used to determine the concentration of nicotine inhaled by the participants for (A) 8 mg/g nicotine; (B) 16 mg/g nicotine; (C) 20 mg/g nicotine Puritane™ original flavoured e-cigarettes (n= 2). To determine the average concentration of nicotine delivered, e-cigarette aerosols were collected onto 44 mm Cambridge filter pads for each replicate analysis. The Cambridge filter pads were extracted with isopropanol containing heptadecane as the internal standard. The extract was injected onto a SupelcoWax™ column (15 m × 0.32 mm × 1 μm) and the concentration of nicotine was determined by GC-FID (Thermo Fisher Scientific). The PTR-MS instrument was not used for measuring the concentration of nicotine delivered per puff at this stage as a dilution system was not available that would have been able to accurately dilute the mainstream e-cigarette aerosol to a suitable level within the dynamic range given the high sensitivity of the instrument. Greater than 1000-fold dilution factors are required and development work is currently in progress. Three experienced male e-cigarette users (27-34 years) participated in this study. The aim of this study was not to assess variability between e-cigarette users but to establish a proof-of-concept method to determine exhaled nicotine concentrations. As such the three e-cigarette users followed a series of specified vaping topographies as shown in Table 2 for each e-cigarette. For each vaping session, the test e-cigarettes evaluated by GC-FID above were vaped through a cigarette holder attached to a smoking puff analyser mobile device (SPA-M; SODIM, France). This device is typically used to record smoking topographies during use of conventional cigarettes but a specific adapter was fitted to allow it to be used for the e-cigarettes. As the device records time, puff duration, volume inhaled and pressure drop, it was used in this study to record the vaping topography of the e-cigarette users. Table 2: Vaping topographies applied to assess retention of nicotine under various conditions. From the participant’s recorded vaping topography, the concentration of nicotine inhaled per puff was determined using the calibration curves obtained with the smoking machine for the corresponding e-cigarette device (Figure 1). PTR-MS technology has been described in detail elsewhere . In this study, a high-sensitivity and high-resolution time-of-flight (TOF) mass spectrometry based PTR-TOF 8000 (IONICON Analytik GmbH, Austria) was utilized. This instrument has recently been characterized by Sulzer et al. . The sensitivity of the instrument is between 100 and 210 cps/ppbv (increasing with increasing mass) and the mass resolution is determined to be 5000 m/Δm. As in most PTR-MS instruments, in the PTR-TOF 8000 water vapour is converted into H3O+ in a hollow cathode ion source. Subsequently, the hydronium reagent ions are injected into a drift tube where they react with all compounds with a higher proton affinity than water via proton transfer. In this study, the drift tube parameters were set to: 600 V voltage applied across the drift tube, 2.2 mbar pressure and 120°C temperature, which results in a reduced electric field (E/N) of 160 Td (Townsend; 1 Td = 10−17 cm2 V). Eventually, product and reagent ions enter a TOF mass analyzer, where they are separated according to their m/z and detected. In this study, the standard sampling setup for the PTR-MS instrument, which consists of a 1 mm inner-diameter PEEK (polyether ether ketone) line in a heated hose, was modified. Given the high sensitivity of the PTR-MS instrument, a dilution system was introduced for the mouth-hold experiments as the total VOC concentrations were greater than the instrument’s upper dynamic range limit. This was realized by using a specially manufactured inlet hose that has a cylindrical box attached to the one end close to the sampling point. The box and the hose were both heated to 120°C, which is the sametemperature as the PTR region, where the hose was connected to i.e., no cold spots were present in the inlet system. In the box, dilution was performed via a Y-piece connected to a 0-air generator, to the PTR-MS instrument and to a 5 cm sampling line (all 1 mm inner-diameter PEEK; 0-air flow controlled with a mass flow controller). The short sampling line was fed to the centre of a 1/4 inch T-piece mounted directly outside the box. Due to the large diameter of the T-piece compared to the sampling line, and the latter being positioned in the centre, only the mainstream breath was sampled where any condensation of compounds on the T-piece inner walls did not influence the results. To measure the concentration of nicotine exhaled when the e-cigarette aerosol was inhaled, the 0-air flow controller was set to 0 i.e., no dilution was performed and the breath was drawn at about 130 sccm (standard cubic centimetres per minute) into the instrument. When the e-cigarette aerosol was held in the mouth only (i.e., not inhaled) the 0-air flow controller was set to 625 sccm and the instrument was drawing 594 sccm, which leads to a dilution factor of 20. In order to determine absolute concentrations of nicotine in the exhaled breath, the established method described by Lindinger et al. was used. In short, this method uses the fact that the conditions in the drift tube are well-known and the reagents as well as the reactant ion yields are measured, to calculate the concentrations. Although this method is somewhat less accurate than calibrating the PTR-MS instrument with the chemical of interest, it is appropriate for this proof-of-concept study. To correct the calculated concentration values for any fragmentation of the nicotine molecule upon ionization, the headspace above a nicotine standard (7.2% wt/ vol in propylene glycol, Nicobrand, UK) was first analysed. The most abundant product ion upon proton transfer from H3O+ to nicotine (C10H14N2) was the protonated parent ion at m/z 163.12. Additionally, mass spectral peaks at m/z 161.11 (most probably loss of H2) and m/z 84.08 (most probably C5H10N), with 7% and 8% of the total intensity, were found respectively. Thus, the calculated nicotine concentration was multiplied by a factor of 1.177 to correct for fragmentation. Finally, for those measurements where dilution of the sample gas was employed (mouth-hold topographies), the concentration was multiplied by the dilution factor. In order to determine the concentration of nicotine delivered to the participants, a calibration curve showing the relationship between the concentrations of nicotine in the e-cigarette aerosol as a function of puff duration for the machine-vaped e-cigarettes was generated. Whereas puff volume has been shown to have a major impact on conventional cigarette smoke yields  – due to the importance of airflow to the combustion zone of the cigarette - the major parameter for e-cigarettes is puff duration, which corresponds to the time that the coil is heated and aerosol is produced . 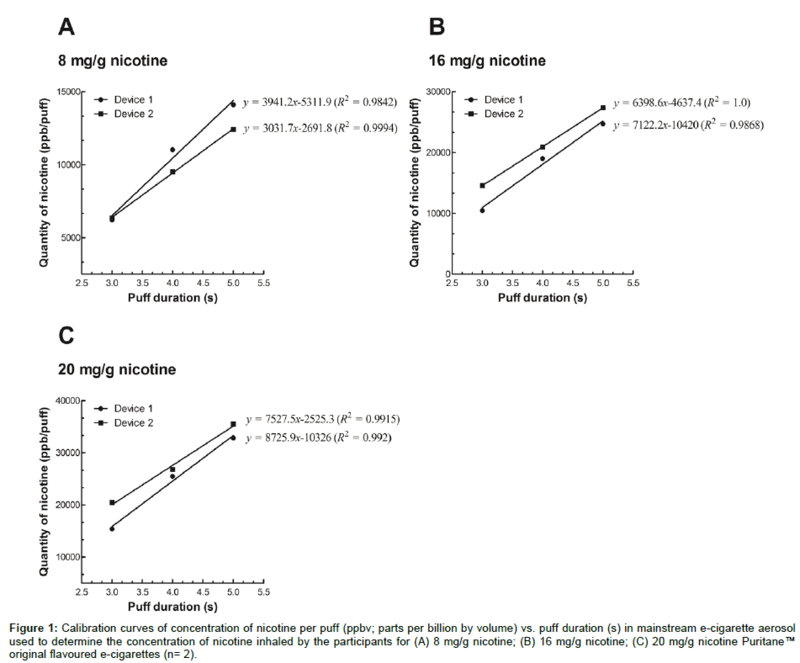 The relationship between puff duration and nicotine delivery for the two independent e-cigarette devices is shown in Figure 1 and are consistent with the findings of Davis et al. . Tables S1, S2 and S3 show the results for the concentration of nicotine delivered to each participant in each puff as determined from the participant’s recorded puff duration using the calibration curve corresponding to the e-cigarette device used (Figure 1). Measuring e-cigarette user’s topography with a device similar to the SPA-M device used in this study has been shown to have no impact on nicotine yields delivered to an e-cigarette user during each a puff . In order to determine the concentration of nicotine exhaled following e-cigarette use for the different topographies, participants exhaled directly into a PTR-MS instrument. Tables S4, S5 and S6 show the results for the concentration of nicotine exhaled by each participant as calculated from the ion yield for protonated nicotine (m/z 163). Each of the concentration values represents the average over 5 puffs using the instructed topography (Table 2). These results have to be interpreted in combination with the inhaled nicotine concentrations, which is reported above, nevertheless some general observations can be made. From Tables S4, S5 and S6 it can be observed that the nicotine concentrations in the exhaled breath after mouth-hold only topographies are on average about 3 orders of magnitude higher than after inhalation of the e-cigarette aerosols, regardless of the nicotine concentration in the e-cigarette cartridge. Furthermore, it appears for both vaping topographies that the breath-hold duration does not have any effect on the exhaled nicotine concentration, as the concentration values do not correlate with breath-hold duration. For the 8 mg/g nicotine e-cigarette the average concentrations are comparable within the respective topography for all three users i.e., around 450 ppbv for mouth-hold and 0.6 ppbv for inhalation topographies. For the 16 mg/g and 20 mg/g nicotine e-cigarettes this changes substantially, as in both cases e-cigarette participant 3 exhaled a nicotine concentration after the mouth-hold topographies that is about 5 times higher than for the other two participants. Interestingly, this phenomenon is not observed for the inhalation topographies, where e-cigarette participant 3 has no extreme values. This is not surprising as the aerosol is not subsequently inhaled to the lung during the mouth-hold only topographies. In summary, it is observed that the nicotine concentration in exhaled breath is dependent on the vaping behaviour of the user. This has a greater impact on the concentration of nicotine in the exhaled breath than the concentration of nicotine in the e-cigarette cartridge. By knowing the inhaled and exhaled nicotine concentrations per puff the nicotine retention rate following use of the e-cigarettes by the experienced participants was estimated using Equation (1). The mean values for the concentration of nicotine delivered and exhaled and therefore the concentration retained by the three e-cigarette participants across each e-cigarette for the mouth-hold and inhalation topographies is summarized in Table 3. Each participant’s individual nicotine retention rate following use of the 8 mg/g, 16 mg/g and 20 mg/g nicotine e-cigarettes for both vaping topographies is reported in Tables S7, S8 and S9, respectively. Whether there is a commensurate increase in nicotine retention with higher e-cigarette nicotine concentrations when the aerosol is held in the mouth only will be explored in future studies using the methodology present in this paper. Table 3: Mean concentration of nicotine delivered and exhaled and nicotine retained for each mouth-hold and inhalation topographies across all e-cigarette users for the different nicotine-containing e-cigarettes. The retention rate of nicotine, expressed as a percentage of the delivered concentration, was found to be >99% on average when the e-cigarette aerosol was inhaled (Table 3). Changing breath-hold durations did not impact the quantity of nicotine retained when the aerosol was subsequently inhaled (see Tables S7, S8 and S9). Our reported values for nicotine retention rates following inhalation of e-cigarette aerosols by experienced e-cigarette users are consistent with the reported literature values in smokers of conventional tobacco cigarettes. For example, Armitage et al. found 98% and 99% nicotine was retained when the tobacco smoke was inhaled following a 0 second and 10 second breath-hold, respectively [20,21]. Our data also indicate a substantial fraction of nicotine, on average 86%, is retained within the mouth and possibly upper respiratory tract when e-cigarette aerosol is held in the mouth only and not inhaled (Table 3). Increasing breath-hold duration did not increase the quantity of nicotine retained when the aerosol was kept in the mouth only (see Tables S7, S8 and S9). High levels of nicotine retention have also been reported for mouth-hold only topographies for other nicotinecontaining products (i.e., where the smoke/aerosol is not inhaled). Armitage et al. reported 47% nicotine was retained by the user when cigarette smoke was held in the mouth  and Lehmann reported 46-70% nicotine was retained by the user when cigar smoke was held in the mouth and not inhaled, summarised and reviewed by ref . Lehmann et al. also found at least 90% of nicotine was retained by the user when a nicotine aerosol, at a concentration similar to nicotine in cigarette smoke, was kept in the mouth and not inhaled, summarised and reviewed by ref . We hypothesise that the high nicotine retention rate following inhalation of the e-cigarette aerosol is likely due to the evaporation of nicotine out of the aerosol particles and/or diffusion to the surface where it is absorbed (pulmonary nicotine absorption). Similarly, it is likely this evaporation/diffusion and absorption also occurs in the mouth (buccal nicotine absorption) given a retention rate of up to 86% was observed in the mouth-hold only topographies. Whether these retention rates correlate with an increase in nicotine intake into the systemic system was not determined in this study; further research in this area will be informative. A recent assessment of indoor air quality during e-cigarette use found no measurable increase in the airborne concentrations of nicotine when compared with no vaping control sessions or background measurements . The authors suggested this may be attributable to the high retention rate of nicotine following e-cigarette use . The results from this present study support the suggestion that extremely low concentrations of nicotine are exhaled following inhalation of e-cigarette aerosols as a result of the high nicotine retention rate i.e., >99%. The 2015 review of the scientific literature by Public Health England also noted that use of e-cigarettes “release negligible levels of nicotine into ambient air with no identified health risks to bystanders” , which can be attributed to the high retention rate of nicotine by e-cigarette users as reported in this study. Since vaping topography parameters (i.e., puff volume, puff frequency, puff duration) can vary from user to user, this study provides a “snap shot” of e-cigarette user retention efficiencies. In this study, e-cigarette users were asked to use the e-cigarettes according to a series of defined topographies; the aim was not to assess inter-subject variability. A subsequent study involving a larger number of subjects will show if the findings in this study are valid for a larger population using different e-cigarette devices (e.g., ‘open’ systems) where the vaping topography is not controlled (i.e., ad libitum product use). Nevertheless, the methodology presented in this study shows that the PTR-MS technology combined with the SPA/M puff topography analyser and GC-FID analyses is an efficient, flexible and fast method that can be used to determine the retention rate of other nicotine product aerosol constituents of interest. In this study the concentration of nicotine delivered during vaping by experienced e-cigarette users was estimated and the concentration of nicotine subsequently exhaled from each puff on the ‘closed’ system commercially available e-cigarette was measured. From this, it was found that the retention rate for nicotine was >99% on average following inhalation of e-cigarette aerosols and 86% on average following holding aerosols in the mouth-hold only (i.e., no inhalation). This study’s findings of retention values up to 99% for nicotine were in good agreement with previously-published values for other nicotine containing products. The experimental protocol presented here can also be used to measure the concentration of other chemical compounds that may be present in e-cigarette aerosols and to determine the retention rates of those compounds which is useful in the evaluation of e-cigarettes from a consumer or bystander perspective. We would like to thank the analytical testing laboratories at Imperial Tobacco Group for their assistance with the GC-FID measurements and Dr Peter Wilkinson and Dr Steve Stotesbury (Imperial Tobacco Group) for helpful discussions. This project was supported by Fontem Ventures B.V., a fully owned subsidiary of Imperial Tobacco Group. The e-cigarettes used in this study were manufactured by Fontem Ventures B.V., a fully owned subsidiary of Imperial Tobacco Group. Farsalinos KE, Polosa R2 (2014) Safety evaluation and risk assessment of electronic cigarettes as tobacco cigarette substitutes: a systematic review. Ther Adv Drug Saf 5: 67-86. McNeill A, Brose LS, Calder R, Hitchman SC, Hajek P, et al. (2015) E-cigarettes: An evidence update; Public Health England. Lermenier A, Palle C (2014) Results of the etincel - ofdt electronic cigarette survey: Prevalence, purchase and use behaviours, reasons for using electronic cigarettes. Cheng T (2014) Chemical evaluation of electronic cigarettes. Tob Control 23 Suppl 2: ii11-17. Goniewicz ML, Knysak J, Gawron M, Kosmider L, Sobczak A, et al. (2014) Levels of selected carcinogens and toxicants in vapour from electronic cigarettes. Tobacco control 23: 133-139. Burstyn I1 (2014) Peering through the mist: systematic review of what the chemistry of contaminants in electronic cigarettes tells us about health risks. BMC Public Health 14: 18. Colard S, O'Connell G, Verron T, Cahours X, Pritchard JD (2015) Electronic cigarettes and indoor air quality: A simple approach to modeling potential bystander exposures to nicotine. International journal of environmental research and public health 12: 282-299. Ellis AM, Mayhew CA (2014) Proton transfer reaction mass spectrometry: Principles and applications. John Wiley & Sons Ltd: Chichester, UK. Herbig J, Müller M, Schallhart S, Titzmann T, Graus M, et al. (2009) On-line breath analysis with PTR-TOF. J Breath Res 3: 027004. Blair SL, Epstein SA, Nizkorodov SA, Staimer N (2015) A real-time fast-flow tube study of voc and particulate emissions from electronic, potentially reduced-harm, conventional, and reference cigarettes. Aerosol Science and Technology 49: 816-827. CORESTA. 2014 electronic cigarette aerosol parameters study. Goniewicz ML, Hajek P, McRobbie H (2014) Nicotine content of electronic cigarettes, its release in vapour and its consistency across batches: regulatory implications. Addiction 109: 500-507. Goniewicz ML, Kuma T, Gawron M, Knysak J, Kosmider L (2013) Nicotine levels in electronic cigarettes. Nicotine Tob Res 15: 158-166. Sulzer P, Hartungen E, Hanel G, Feil S, Winkler K, et al. (2014) A proton transfer reaction-quadrupole interface time-of-flight mass spectrometer (ptr-qitof): High speed due to extreme sensitivity. International Journal of Mass Spectrometry 368: 1-5. Lindinger W, Hansel A, Jordan A (1998) On-line monitoring of volatile organic compounds at pptv levels by means of proton-transfer-reaction mass spectrometry (ptr-ms) medical applications, food control and environmental research. International Journal of Mass Spectrometry and Ion Processes 173: 191-241. Colard S, Verron T, Julien R, Cahours X, Stephen WP (2014) Relationship between cigarette yields and smoking time under different machine smoking regimes. In Contributions to Tobacco Research 26: 4-18. Davis P, Ashmore L, Martin S, Wright C, Harang M, et al. (2014) In Influence of machine-based puffing parameters on aerosol yields from e-cigarettes, Global Forum on Nicotine, Warsaw, Poland. Spindle TR, Breland AB, Karaoghlanian NV, Shihadeh AL, Eissenberg T (2015) Preliminary results of an examination of electronic cigarette user puff topography: The effect of a mouthpiece-based topography measurement device on plasma nicotine and subjective effects. Nicotine & tobacco research : official journal of the Society for Research on Nicotine and Tobacco 17: 142-149. Armitage AK, Dixon M, Frost BE, Mariner DC, Sinclair NM (2004) The effect of tobacco blend additives on the retention of nicotine and solanesol in the human respiratory tract and on subsequent plasma nicotine concentrations during cigarette smoking. Chemical research in toxicology 17: 537-544. Armitage AK, Dixon M, Frost BE, Mariner DC, Sinclair NM (2004) The effect of inhalation volume and breath-hold duration on the retention of nicotine and solanesol in the human respiratory tract and on subsequent plasma nicotine concentrations during cigarette smoking. In Beiträge zur Tabakforschung / Contributions to Tobacco Research 2: 240. Baker RR, Dixon M (2006) The retention of tobacco smoke constituents in the human respiratory tract. Inhal Toxicol 18: 255-294. O'Connell G, Colard S2, Cahours X3, Pritchard JD4 (2015) An Assessment of Indoor Air Quality before, during and after Unrestricted Use of E-Cigarettes in a Small Room. Int J Environ Res Public Health 12: 4889-4907.